Nungubane Game Lodge in Limpopo in the scenic undulating raw African bush of the malaria-free Welgevonden Private Game Reserve. At Nungubane Game Lodge you can see Africa's Big Five animals without needing to take anti-malaria precautions, just 3 hours from Johannesburg. 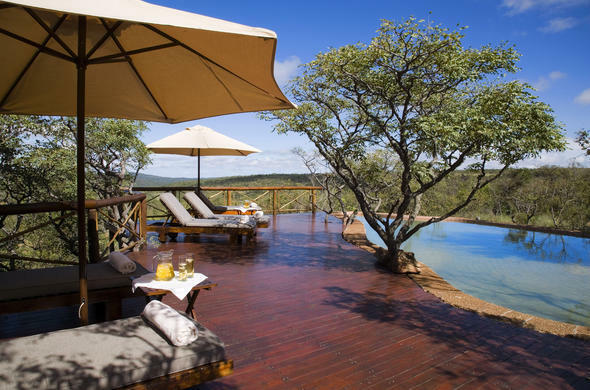 This lodge in Limpopo accommodates only 10 guests in 5 luxury chalets. Each of Nungubane's luxurious thatched chalets have their own private game viewing deck and lots of little luxuries. The chalets have expansive views over the sprawling bushy game reserve and you can watch sunrise dance on the distant hills. You should be up to see the sunrise, as this is the best time of day to go on a game drive to see lions and other nocturnal animals, that have not yet settled down for their day's rest. The décor at this lodge in Limpopo imparts a really comfortable African feel, with plump afro-fabric cushions, open thatch and beam ceilings, and touches of cane here and there. This airy yet still cosy feel extends to the outdoor wooden decks where the dining table is set up, with views across the splendid African bush.